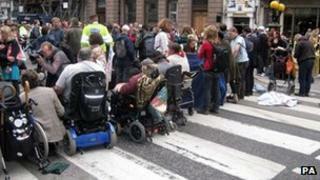 Demonstrators have staged events across England in opposition to planned changes to legal aid. Campaign group UK Uncut said hundreds had protested in town and cities such as London, Manchester and Northampton. It said plans aimed at saving £220m from the criminal legal aid bill in England and Wales would "block access to justice for millions of people". The Ministry of Justice says legal aid costs too much and can not be "immune" to efficiency commitments. Proposals for possible savings include stopping defendants with a disposable income of more than £37,500 from automatically receiving legal aid, and curbing prisoners' right to legal aid. Legal aid costs taxpayers about £2bn every year, with criminal defence making up more than half of the expenditure. The government says the situation is unsustainable and wants to see fewer, bigger organisations providing legal aid as part of a streamlined system. However, the Bar Council has argued this would result in the end of the long-standing right of a defendant to choose a legal aid solicitor, saying people would effectively be allocated a representative on the basis of cost. Some groups have also expressed fears that the changes could deny justice to the poorest in society. UK Uncut said protests had taken place in London, Manchester, Hull, Liverpool, Northampton, Cambridge and Norwich on Saturday. In London, demonstrators gathered on the Strand at about 12:00 BST to set up a roadblock. Many protesters sat on the road and others put their bicycles in the way of traffic. The area was reopened around two hours later when the demonstration was contained in a smaller area. Protesters also held a mock trial for Justice Secretary Chris Grayling, and attached a banner to the fence of the court building which warned: "No justice, no peace." The Metropolitan Police did not comment when asked about the number of protesters. But the City of London Police said it had warned the group they were stopping the emergency services from travelling around the capital. UK Uncut said roadblocks had also been set up in Manchester, Northampton and Cambridge. Spokesman David Conway said: "The government's plans will block access to justice for millions of people. "We're blocking roads to make a stand against that and to make it clear how strongly people around the country oppose these outrageous plans. "People will have to represent themselves in court and get compensation much later than they should." An MoJ spokesman said: "We have one of the best legal professions in the world, but cannot close our eyes to the fact that - at around £2bn - legal aid is costing too much." He said the government's planned reforms would create a sustainable legal aid system that would "still be one of the most generous in the world". The spokesman added: "At a time when major financial challenges are being felt by businesses and households across the country, the legal sector cannot be immune from the government's commitment to getting better value for every penny of taxpayers' money we spend." Plans to remove the right for defendants in criminal cases in England and Wales to choose their solicitor under the legal aid system were scrapped in July. The government had planned to put the onus on lawyers competing for contracts, but has said it now recognises that choice is seen as "fundamental".